You hear adventure calling in the distance, you are beginning to get excited about the arrangements, and then you hear your baby cooing from the next room. This trip you will be flying with a plus (little) one, and this will be no routine flight or packing experience. With the right game plan, you can be a pro traveler with a baby in tow in no time at all. 1. Let’s start by making a list. 3. Pack lightly and dress in layers. 4. Extra assistance is available. Use it! 5. You can overthink… Just don’t overpack. 6. Your list is waiting … Just add pen to paper. 7. What are you waiting for? We have a trip to plan! The days of throwing things into a suitcase and jetting off on an adventure are a distant memory when flying with an infant. Making a checklist has helped me many times when traveling with my two children. Any time that I decided to just “wing it,” I would show up either ill-prepared or overprepared – an exhausted mom, with too much luggage and not enough hands to carry everything. In this day of smartphones and apps to handle everything, we are prone to keep a list on our phones and forgo the handwritten one. Keep in mind that your battery can run out, you can misplace your phone or other devices, or you may not be able to access the cloud while flying through the clouds. 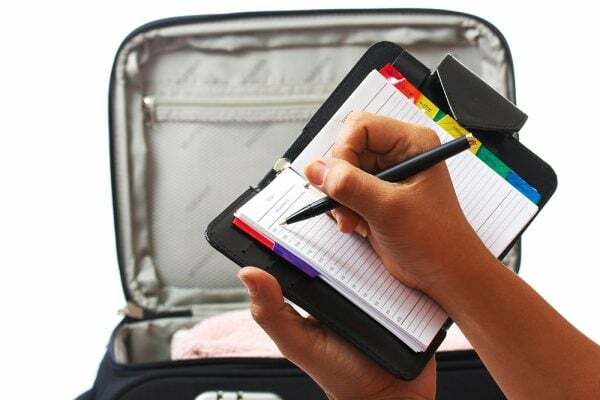 A handwritten list, provided below, can be your best friend while traveling. Start organizing a few weeks or, even better, a month out from your travel time, if possible. In a perfect world, we would have at least a month to plan a flight with a little one in tow. Life isn’t always perfect, and schedules get moved around, but you can still arrive at your destination seamlessly with the right planning. Here are a few steps to lead you in the right direction. Book in advance, and aim for nonpeak hours and midweek flights. This will help you avoid rush-hour traffic, check-in crowds, and delays. When booking your flight, strategic seat planning is key. Book a seat next to an empty seat and near the toilet or changing area. Opt for bulkhead seating for longer flights. Some aircraft for extended or overseas flights have bassinets available by request. Note, though, that there are weight and height requirements to use the bassinets; check with the airline to make sure your child meets those guidelines. If budget allows you, get a seat booked for your little one as well. You will be thankful for the extra room. 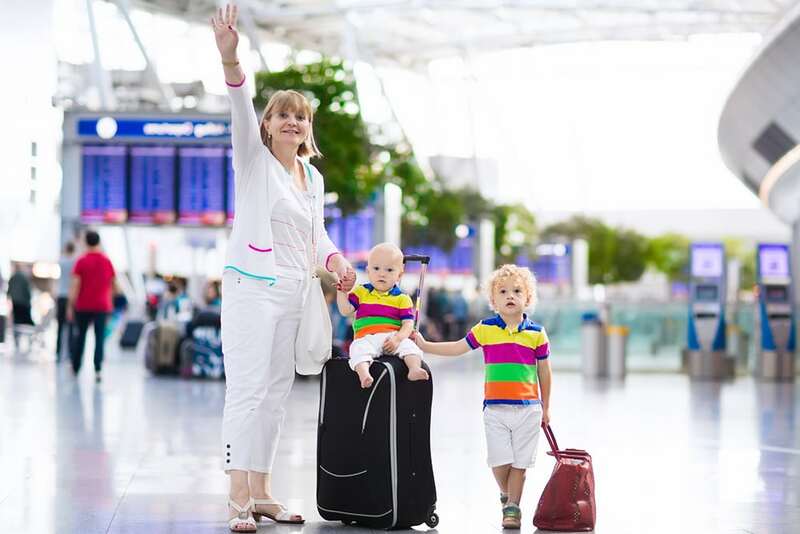 Additionally, keep in mind most airlines allow your little one to fly up until the age of two without a ticket. However, if they turn two during the trip, you will be required to purchase a ticket for the return trip. Also, double-check the airline’s policy on baby seats and strollers. Common sense advice straight from Mom herself. Having fewer and lighter bags to carry will make it easy for you to change the baby during travel. Dressing your baby in layers will allow for a quick change as you can just peel one layer off should anything get spilled. Pack two changes of clothes, four diapers, wipes, cream and lotion, three to four of baby’s favorite toys, and a swaddling or soothing blanket in the diaper bag. Some airlines allow for an extra bag for the baby, and some do not; double-check upon booking. A great pro tip I picked up is to pack gallon-size ziplock bags. They are great to store wet or soiled clothes to avoid contact with the clean items in the diaper bag. Once you have your lodging reservations locked in, survey the area online to locate the nearest pharmacy or megastore, and plan to purchase bulk items such as diapers, formula, baby food, and other essentials. With the growing popularity of on-demand delivery, you can have the items waiting for you upon your arrival. If you are going to a location that does not offer on-demand delivery, you can opt to ship these items ahead of time. While planning your trip, arrange for someone drive you to the airport. Dropping off at the gate is much more convenient than pushing a stroller and lugging baggage from a parking deck. Check in online or arrive early to check in with ample time to reach your boarding gate. Also, dress yourself and your baby sensibly to avoid any delays at the security check. As you approach the security check as well as customs, look for special family lines. Head to the extra assistance group to make boarding the plane easier. Remember that your baby will receive a boarding ticket, even if they are seated on your lap. If you need help to move through the airport, you can hop on one of the in-house golf carts to move you between gates. Once you reach your destination, plan for someone to pick you up from the airport. It will make for an easier transition for you and your little one. You are also adding in an extra set of helping hands. Who couldn’t use those from time to time? You are heading on a vacation or visiting friends & family. You don’t want to start the trip exhausted from carrying too much gear and luggage. I have been guilty of being overprepared and creatively packing for the trip and then praying everything will fit back in my luggage for my departure. Some resorts offer laundry facilities on-site. If you are staying with family, they are likely to have a laundry room at your disposal. This might sound like extra work, but what you are doing is giving yourself an hour or two of quiet time to catch up on a good book or to do some Netflix binging. If you have a set of helping hands around to watch your little one, then, by all means, take the downtime. I underpacked, on purpose, for a nine-day trip with my two boys. What I received was a trip to the laundry room, while they enjoyed the pool with my boyfriend. Sounds like punishment to you? Not so fast! It takes all of ten minutes to gather the laundry and load it in the washing machine. You have to be nearby to change it out, in about 35–50 minutes, right? Enjoy that quiet time. Take a walk or sit by the pool. Grab a coffee or refreshing beverage. That’s right; I said sit by the pool! I did that on my trip, and it was delightful! The resort we stayed in had three pools. My kids and boyfriend were playing in the one closest to our room. The laundry room was conveniently located next to a pool with a bar. It’s amazing how a tiny paper umbrella, in your drink, can help you unwind. By the time your clothes are done in the dryer, you have received two hours of free time with only about ten total minutes of work. You remember what those are, don’t you? There is something profound about handwriting. We all should practice our penmanship more. Putting something in your own handwriting means more than something pecked out on a keyboard or dictated via voice to text. I am the queen of making lists and keeping them as a guide to keep me on task. I’m not talking about tiny shreds of paper all over the place. I mean an honest-to-goodness list by the day or event. I received a Snoopy “To Do Today” notebook as a child. I loved that notebook, and whenever I need to plan a schedule, that image always pops into my head. I have provided planning sheets— minus Snoopy, but feel free to doodle him or anything else in. 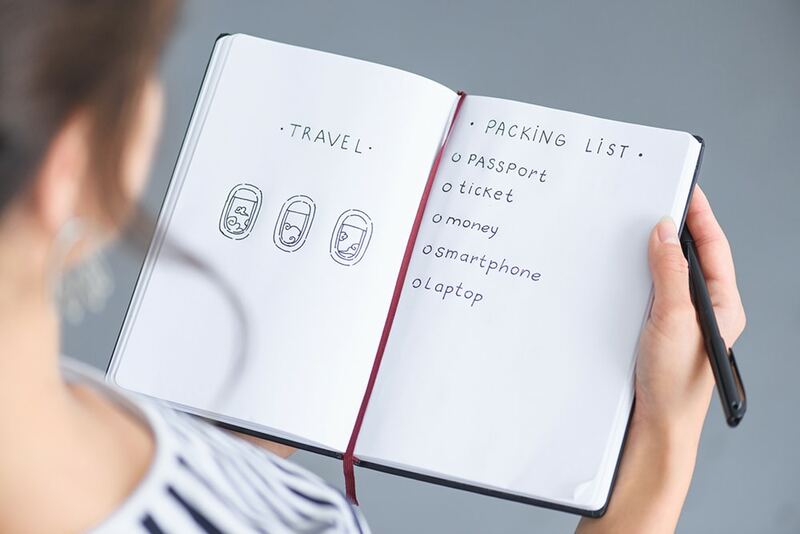 You can download and write out your pre, during, and post travel plans. If you aren’t that strong in your penmanship, then, by all means, use your computer to type your list and save it to your smartphone. Just print a hard copy to keep you from panicking if you can’t access your cloud. Better yet, print it and keep it along with your flight details, hotel reservations, and other confirmation numbers while traveling. It goes without saying that, you need your proper identification to travel, but make sure that you have the proper travel documents for your little one as well. Travel is still an option even with infants. You just need to be sure to check off all the boxes before you head to the airport. 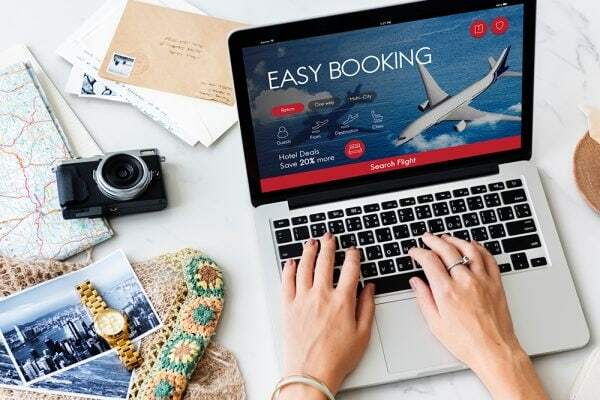 Here is a quick rundown of other options that you may want to ask the airlines when booking or review online with the TSA before selecting your flight. 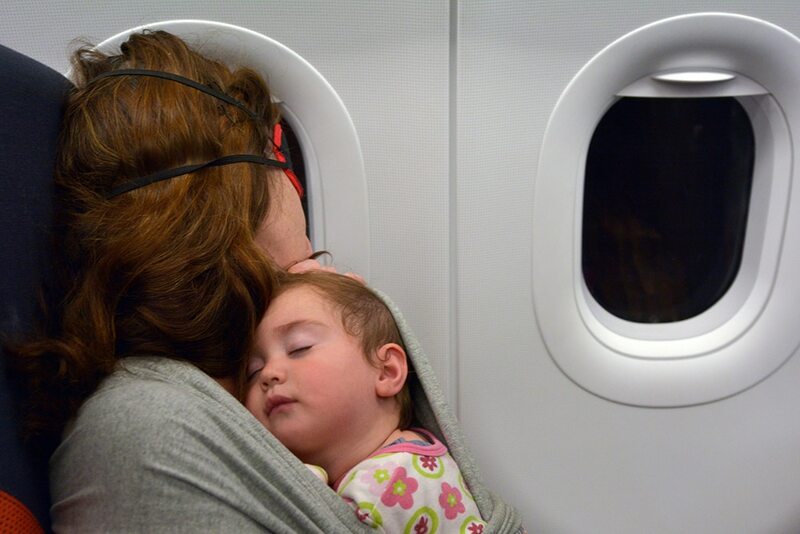 If you are breastfeeding your infant, could you have a window seat for more privacy? Are changing facilities available on board the plane? What are the airline’s policy on strollers and car seats? What is the policy on wearing a baby carrier? What is the policy for bringing baby food or formula? Can you have assistance boarding and deboarding the flight? What is the time between connecting flights? Can you catch a shuttle between your gates? Once you have all of your proverbial “ducks in a row,” you will be ready for your flight. Now your only job is to entertain your little one until you arrive at your destination. 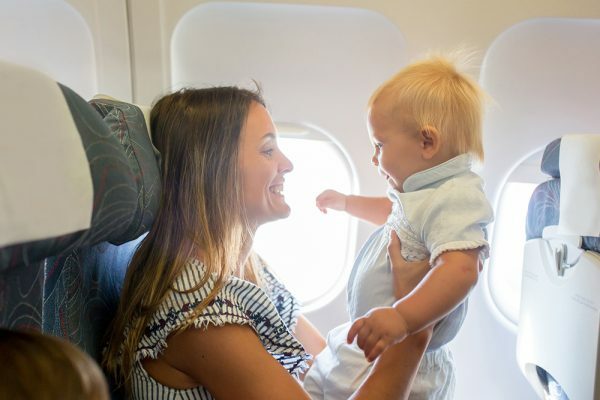 Might I suggest noise-canceling headphones, a few games, and apps that you can use during the flight to help pass the time, and your baby’s favorite toy. Don’t forget a pacifier will alleviate the pressure on those little ears. A great tip that I received early on, which works wonders, is bringing some goodie bags or small treats for those people seated around you. Everyone likes getting a little surprise now and again. It will go a long way to win friends and influence those sitting near you on the plane. If you do receive a few cross looks from people on the plane, just ignore those looks. They have obviously forgotten what it is like to be a kid. I find grumpy, petulant adults more irritating than anything in the world. Perhaps airlines should install a “naughty step” or “time-out chair” for this kind of people on board.